Talk about setting the stage. Director Joe Dowling is certainly a maestro. His vision in crafting The Merchant Of Venice revival now playing Minneapolis' Guthrie is quite an exquisite feast for the eyes, even if the threatened pound of flesh itself remains anything but kosher. As Guthrie's artistic director, Dowling has clearly taken great pains in advance to forcefully address the inherent anti-Semitism that makes this Shakespeare comedy an often difficult pill to swallow. From the extensive notes in the program -- Rabbi Joseph Telushkin is quoted: "The damage inflicted on the Jews by The Merchant Of Venice has been far greater than a pound of flesh..."-- to the scheduling of a special April 16 discussion between Dowling and University of Minnesota's Dean Steven J. Rosenstone on the play's "issues and controversies," the director is not only setting the stage for contemplative dialogue around its second presentation on a Guthrie stage, but he also appears to be seeking some political cover. Putting aside for the moment the more repugnant aspects of Shakespeare's work -- and I'll come back to that shortly since it looms so large -- my biggest difficulty in approaching any Shakespeare play is fine-tuning my admittedly failing hearing to the cadence of the spoken word. Spoken English from the 17th Century is, of course, foreign to the ears of most Americans. And at the Guthrie, which eschews miked actors, it means paying extraordinarily close attention just to follow. Fortunately, the huge superb cast handles the often challenging diction as if it were second nature and never sounds forced. Three performances are especially noteworthy. As Portia, the ravishing, riveting Michelle O'Neill offers a galvanizing cogency to the entire proceedings. Robert Dorfman offers a surprisingly sympathetic Shylock, the redoubtable Jewish moneylender, particularly via his impassioned soliloquy asking, "If you prick us, do we not bleed?" And as Antonio, the titular merchant, Richard S. Iglewski -- arguably one of Minneapolis' best character actors -- displays a moving, resigned imperturbability toward his would-be fate for his incapacity to repay Shylock. This is also a dazzling production to behold in terms of its luxuriant design. Riccardo Hernández has succeeded in trumping his own breathtaking set design from Edgardo Mine with a glorious stage, which teamed with Matthew Reinert's elegant richly-hued lighting design (that also features a series of chandeliers) and Paul Tazewell's opulent costume design, beautifully evokes a prosperous Venice. But for all the top-tier efforts in gilding this lily, it's worth recalling that even Shakespeare once used his beloved character named Juliet to say, "[A] rose by any other name would smell as sweet." At the polar opposite would be this case of The Merchant Of Venice. No matter how dressed up Dowling has made this production, and no matter how cartoonish he reinterprets those characters who express the most contemptible notions regarding Jews, the vile stench from their demonization still hangs in the air long after Shylock withdraws from the stage. It is indeed true that many Jewish boys at school have, through generations, been taunted and execrated as "Shylock." This is to the shame of all humanity. But the remedy is not, I sincerely believe, to boycott Shakespeare's play, and pretend it does not exist, but to interpret it so that it becomes, as its author intended, a fantasia on the twin themes of mercy and justice, in which none of the characters fully exemplify either, in which none of the characters is either wholly good or wholly evil. With that, I find myself recommending this show, even if its subject matter gives me tremendous pause. You've written about a very controversial work of literature with your usual thoughtfulness and sensitivity. Thank-you. I have to admit, I don't find Shakespeare's language very accessible. Before I saw Hamlet last year, I bought a copy of the play that had the original version on one side and a modern translation on the facing page. If I hadn't done that, it would have been very difficult to figure out what was going on! As for the content of The Merchant of Venice, I guess there's always the question of how you judge a work of art, by the standards of its time or by our own, hopefully more enlightened time. I've remembered the "If you prick us do we not bleed" soliloquy ever since I first read it more than two decades ago. But as you wrote, despite that plea, you can't escape the anti-Semitism. There are a lot of old movies that I like, but I cringe when I see how African-Americans are portrayed. Even some novels that have very beautiful, poetic language have passages that contain vile stereotypes. It's very difficult to get past that, no matter what other messages those works may contain. I think that's why I have so little enthusiasm for a musical version of "Gone With The Wind." And Margaret Mitchell is no Shakespeare! Esther, Thanks for your thoughtful comments. Last evening, it struck me that despite our perceived enlightenment, society always manages to vilify and demonize some group. There are significant numbers who now vilify the Arab world or Muslims. And certainly, there are U.S. politicians who have made a sport out of demonizing those south of American borders who seek a better life in the United States. Also, let's not forget that most of the world currently looks down its nose at Americans. As I've told others before, with 300 million of us, we can't all be bad. Perhaps if by attending a show like The Merchant Of Venice audiences can actually learn how unfair, abhorant and ultimately uncivil such stereotyping can be, even as it holds up a mirror to our own prejudices, hopefully some good will come from re-examining this work. 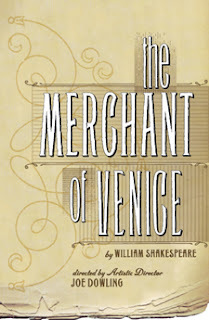 As someone who (in part) studies Shakespeare for a living, I have to admit to having a somewhat different take on _The Merchant of Venice_: I don't think it's so much anti-semitic in itself as it is a comment on the audience's anti-semitism. Yes, the portrayal of Shylock is stereotypical and caricature-ish, and yes, that's a bad thing: but Shakespeare goes out of his way to humanize Shylock, and give him reasons for his behavior that show that it is the Christian characters who have driven him to it through their own hypocrisy. He insists on his pound of flesh because the Christian characters in the play have, in ways that subvert their own stated values, taken everything else away from him. Notice how conspicuous his absence is from the last act of the play: Antonio survives because Portia uses the letter rather than the spirit of the law (something Renaissance-era critics often accused Jews of doing), Bassanio and Portia are married because of the money Antonio borrowed from Shylock and now, conveniently, doesn't need to repay--and he's also taken half of Shylock's fortune. Jessica and Lorenzo, we know, are secure because they know they will inherit the other half. Elsewhere I've seen the play criticized because of the way the play shows Shylock equating everything with money, consistent with a negative stereotype. But the line in which that equation is made belongs to one of the Christian characters, Gratiano, who is, at that moment, mocking Shylock. The line is much more about Gratiano's cruelty than it is about Shylock's Jewishness. And the really damning thing about the line is that it isn't funny unless the audience unconsiously, at least, shares the stereotype of the miserly Jew with Gratiano. So perhaps we shouldn't be asking whether the play was anti-semitic; perhaps we should be asking why the audience laughed when Gratiano spoke that line. What's disturbing about Dowling's production, to me, is not that _Merchant_ is inherently anti-semitic; it's the way it illuminated the anti-semitic ideas still shared by its present-day audience. Mark, Thanks for your thoughtful analysis. I profess that I am the furthest thing from an erudite student of Shakespeare, so I welcome your comments. Again, to quote Tyrone Guthrie, the show is "a fantasia on the twin themes of mercy and justice, in which none of the characters fully exemplify either, in which none of the characters is either wholly good or wholly evil." Your analysis seems to underscore those points quite well. Thanks once again. Thriller Live: What's Really, Really Bad? Thinking: As In "What Were They (Critics)..."